Some serious talent rocked up to support Unity the Stephen Lawrence Memorial concert at the O2 Arena in London including Rita Ora, Jessie J, Emile Sande, Beverley Knight, Ellie Goulding and Ed Sheeran, Plan B, Tinie Tempah, Labrinth, and Jamie Cullum. The stars performed to help mark the twentieth anniversary of the teenager’s death in south east London. Hosted by Nick Grimshaw and Reggie Yates, the concert was part of the SL20 Campaign which is celebrating Stephen’s life with a series of awareness-raising events throughout the year. It was recorded and broadcast on BBC1 and an album of the live performances is also due to be released. XL Video was asked onboard by promoters AEG Live to supply video production which was co-ordinated for them by project manager Gareth Jeanne. He worked closely with the AEG Live production team led by Kahren Williams and Keith Wood. 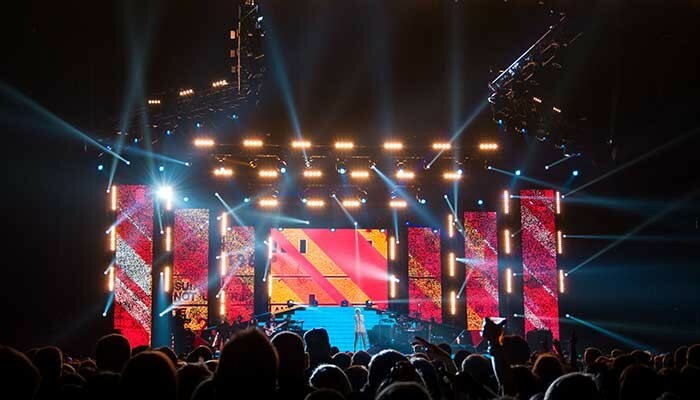 The screen design was conceived by lighting and visuals designer Peter Barnes with input from XL Video and consisted of a 6 metre wide by 4.3 metre deep Pixled F12 LED screen upstage, with three pairs of Stealth legs flanking both sides of the stage. The legs were all 1.6 metres wide, with the front pair taller and the back pair lower to give a shrinking perspective. XL also supplied two 20 x 11 ft screens for left and right IMAG projection, each fed by a rear projecting Barco 20K projector. The Stealth and the Pixled screens received creative content stored on three d3 servers programmed and run by the show’s screens and video director, Richard Shipman. The d3s were all the latest hardware versions, with d3’s R11 software that has improved video capture. Shipman also cut the camera mix using one of XL’s brand new Grass Valley K-Frame switchers running GV’s Karrera software platform. VTs were played in to the system from an EVS machine in the broadcast truck outside the venue to the rear screen; IMAG appeared on the side screens while playback content and ambient visuals for the live performances were sent from the d3 servers to the LED screen and the three sets of legs. XL also supplied a substantial amount of infrastructure including switching, distribution, cable management and plasma relay screens. XL’s five crew were – d3 operator Luke Collins, engineer Gerry Corry, projectionist Mark Cranham and LED techs Matt Gourd and Steve Grinceri. 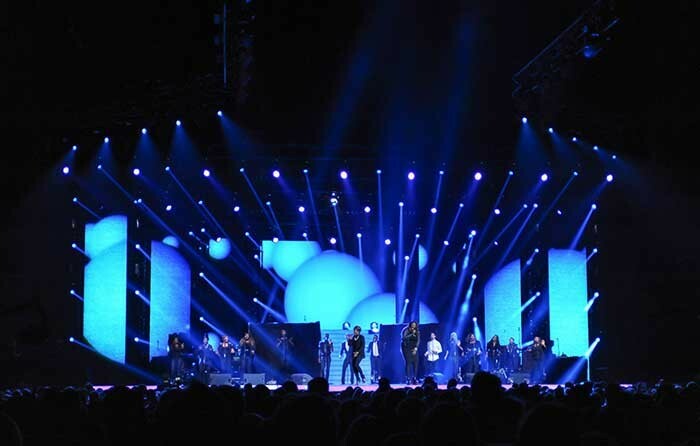 Sound was supplied by Adlib, lighting by Neg Earth and the set by Production North. The event was directed for TV by Paul Dugdale. Funds from the show will go to The Stephen Lawrence Charitable Trust which aims to create brighter futures for young people with disadvantaged backgrounds.